The Abbey range of valves are an excellent accessory for any of our cast iron radiators. These traditional style valves offer the style of luxury valves for a fraction of the price and in the Pewter finish they are outstanding.This unique cast iron radiator valve features a wooden handle on a traditional rotating wheelhead. Manual radiator valves are suitable for use with all radiators but look great with our Traditional Cast Iron Radiators. 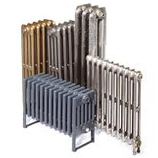 Cast Iron Radiators fitted with manual radiator valves offer maximum control without any compromise on style.